Specifically, for $34.95 you can purchase the economy edition of the downloadable do-it-yourself New Jersey Limited Liability Company kit and then immediately download a 15+ page pdf document. 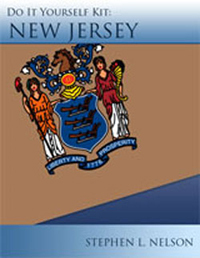 The PDF document describes the benefits of using a New Jersey LLC for your active trade or business and then the kit explains in step-by-step fashion how to set up your New Jersey limited liability company in a few minutes and how to get a federal tax identification number for your new LLC so you can start banking and other financial activities. The economy kit also comes with two sample LLC operating agreements--one for LLCs with a single owner, or member, and one for LLCs with multiple owners, or members. Seattle CPA and LLC expert Stephen L. Nelson has been a CPA for twenty-plus years, He holds a masters in finance from the University of Washington and a masters in taxation from Golden Gate University. The author of numerous best-selling books about accounting and finance, Nelson also taught LLC and Subchapter S corporation tax law at Golden Gate University.